This Bible is sure to catch your eye! Reminds me of "Finding Nemo! 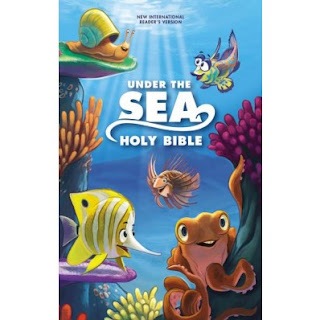 So if you have some fish lovers then this might be the Bible for them. 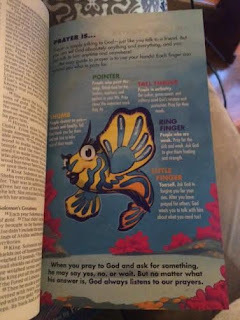 This bible suggests it is for 6-10 year old's but I think it might be a bit challenging for 6 year old's. It is the NIRV- new International Reader's Version so language is pretty easy to understand. The first one is talking about prayer and using your five fingers to help and guide your prayers. Each finger will represent a category to help aide in reminding you what to pray for. 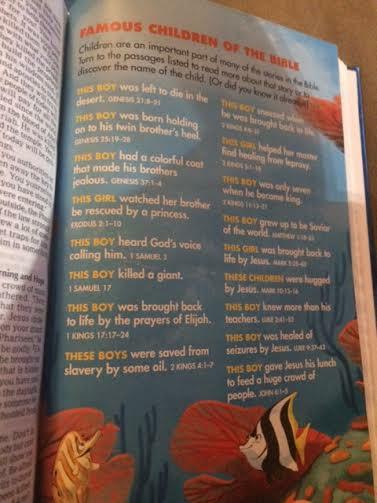 This next page was a guide to read about children in the Bible. 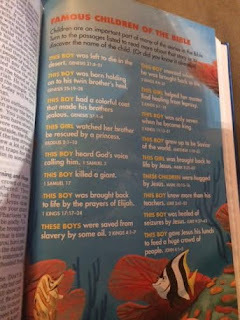 I have never seen a list like this included in a Bible but I think it is perfect for a kids Bible!